We are happy to announce that Nicholas Jewett has recently joined the Hadley Environmental team as our new soil science technician. He is currently pursuing his Masters of Science in Environmental Science at Johns Hopkins University. 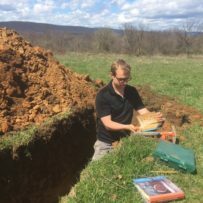 Nick tells us that he has been enjoying the opportunity to apply his background knowledge of geology, hydrology, and soil science to find solutions for real world situations. We are excited to help foster his growth as a soil science professional.